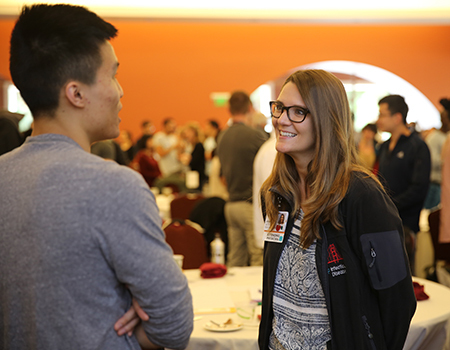 At orientation, medical student coach Bryn Boslett, MD interacts with a first-year medical student. 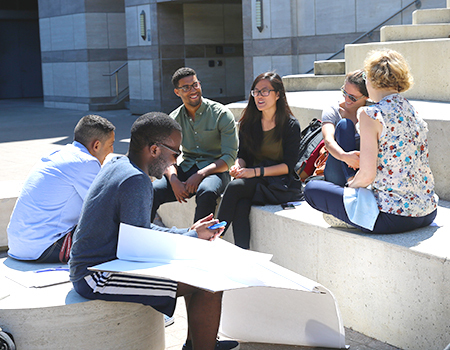 During UC San Francisco School of Medicine's (SOM) orientation week, I had the pleasure of getting to know my fellow classmates. While I enjoyed conversations with my peers during lunchtime and breaks, I was also captivated by what was being discussed in orientation. The Differences Matter section particularly resonated with me, as it addressed the topic of diversity in a new and engaging way. Instead of clicking through tired PowerPoint presentations with slides full of text and dated examples, the SOM provided incoming students with fascinating speakers and a unique opportunity to experience community engagement firsthand. 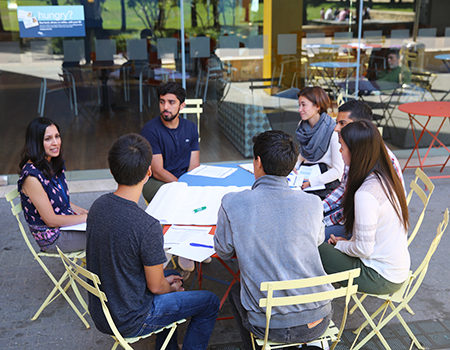 UCSF’s approach to diversity education began with exposing students to personal narratives of people from all walks of life. Following a wonderful introduction by Vice Dean for Education Catherine Lucey, MD, a second-year medical student spoke in great detail about his upbringing in a cramped apartment in Harlem and the challenges he faced on his way to UCSF. His story was met with a standing ovation, and many medical students and faculty members shed tears in the light of his inspiring and eloquently-told narrative. Numerous others spoke during orientation, including J. Nwando Olayiwola, MD, MPH, director of the UCSF Center for Excellence in Primary Care, who shared a particularly harrowing encounter with racism and encouraged students to speak out whenever they witnessed injustice. 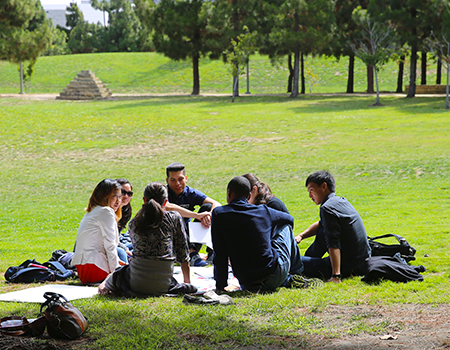 SOM students gather for small group discussion during the Differences Matter portion of medical school orientation. Differences Matter is a campus-wide initiative to develop and sustain a culture of equity and inclusion. In addition to learning from people’s personal experiences with diversity and racism, we heard from those who studied racism in laboratory settings as well. Guest speaker Claude Steele, PhD, spoke in great detail about the stereotype threat, a phenomenon he observed when attempting to understand underperformance and under-participation of minority groups in higher level education. Dr. Steele found stereotype threat to be relevant in situations where individuals believe one of their identities (eg, their gender or their race) is associated negatively with the task they are performing. Individuals worry about being judged based on existing stereotypes, which distracts them from the task at hand and results in underperformance. Following the eye-opening presentations of these accomplished speakers, medical students journeyed from the conference room to various community centers around the city. We spent our afternoons working with local YMCAs to facilitate activities that helped children understand the dangers of excess sugar consumption. When we returned to the conference room to discuss our community engagement experiences, we were struck by how different our afternoons were. Some YMCAs were frequented by children who came from extremely privileged backgrounds, while other YMCAs saw scholarship recipients whose parents could not afford the registration cost. As one would expect, the students’ responses to the sugar activity varied, largely depending on their socioeconomic status. As orientation came to a close, I recognized how much I had learned in a few short days. From hearing the experiences of individuals with lives much different than my own to observing firsthand the impact that socioeconomic status can have on individuals’ health, I left orientation with a greater understanding of diversity. Along with this came two other emotions: gratitude to UCSF and excitement for the years ahead.